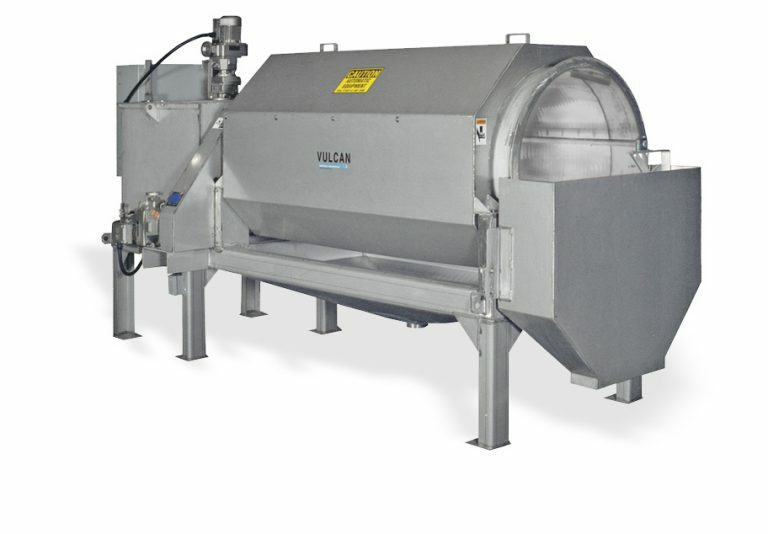 The Liqui-Fuge RDT Rotary Drum Thickener is designed for volume reduction of primary, waste activated or digested sludge and ideal for reducing hauling costs or increasing digester capacity for municipal or industrial sewage treatment facilities. Support structure and all wetted parts available in 304 or 316 stainless steel. A suitable polymer is injected into the incoming sludge feed line, then blended as it passes through an inline static mixer prior to entering the flocculation tank. Once inside the tank, the sludge/polymer solution is exposed to a low-shear rotary mixer to ensure maximum floccule development. The conditioned sludge then flows onto the distribution tray where it is directed onto the rotating drum. The free water passes through the openings in the drum while the captured sludge remains on the drum surface for further dewatering.